Whether it's made with leftover Indian food from our favorite spot or the last serving of a homemade curry or masala, I find myself eating some version of a curried burrito quite often. 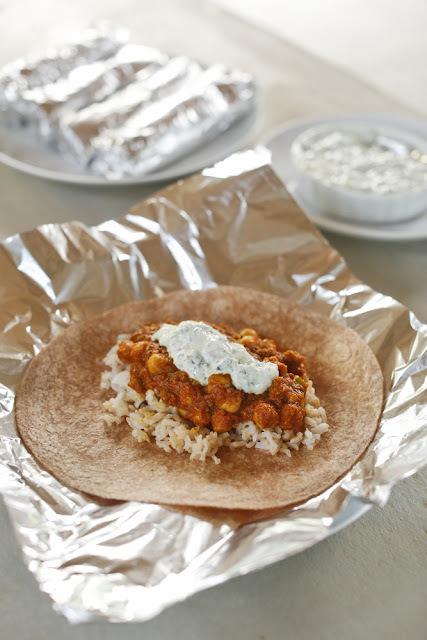 It sounds like it would be a strange cultural mash-up, but it actually works really well -- this version made with masala-spiced chickpeas is really good in particular. Think of the whole-wheat tortilla as really flexible naan bread, and think of this dish as a portable Indian buffet. Some of our favorite Indian foods are fried or laced with full-fat yogurt, lots of ghee, or coconut milk, but chana masala is relatively healthy. It's a simple tomato sauce with chickpeas that only contains a little butter. Slate called chana masala "nutritionally unimpeachable." I think I'd have to agree. This version happens to be portable, too! Into the work bowl of your food processor, place the onion, garlic, ginger, tomato, masala, curry, coriander, vinegar, fenugreek, and sugar. Blend until well incorporated. Place a large skillet or wok over medium-high heat and add the butter. Once the butter is melted, add the paste from the food processor. Cook uncovered and stir occasionally until the mixture has reduced and is thick; this should take about 15 minutes. Looks absolutely delicious! Will have to try it :) Could see this tasting really good with some roasted cauliflower too! WOw this looks so good!!! I'm in my local bookstore cafe right now. The first thing I see after I order my tea is this amazing title--The Southern Vegetarian. How perfect, I'm a southerner, I'm a vegetarian. But, you know, so often, cookbooks, like everything else, fail to deliver. So I opened the book with some trepidation. OMG! Totally awesome, amazing, gorgeous pictures (I'm so hungry now it's not funny). So of course I have to check out the blog, right? Chana burritos?!?! Now I have to make some chana just to make burritos. This looks awesome!! Any ideas on how to make this for those sad people like me who are allergic to tomatoes? Hmmm...what if you added another veg or made this curry instead but kept the same general set-up?